In Needham, the league branch has added 11 members, reaching 159, said Karen Price, who heads it. People want to make a difference in their communities, she said. Brookline league officials said members want to make sure the public is kept informed about decision-making in government, said board member Sanford Ostroy. “People are concerned about the continuation of good government,” he said. Roberta Glass, a member of the board of directors for the league’s Sudbury branch, said that since the presidential election, more people have begun to realize that they have to participate in democracy. The local group has added about six new people since the election, with about 60 total members currently . “They need to be politically active and talk to their representatives in government,” said Glass. 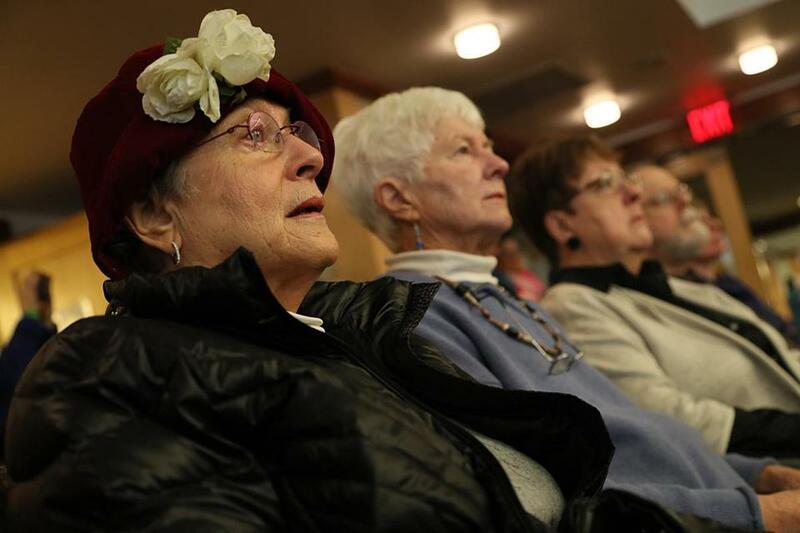 Jeanne Canale, who has belonged to the League of Women Voters of Lexington for the past 12 years, has already seen residents spurred to run for local office and Town Meeting member posts since the November election. “People are now seeing what the impact of an election really means,” Canale said. Lexington’s league sponsored the environmental session, which was presented by members of the Sustainable Lexington Committee. Mark Sandeen, a committee member, pointed to studies that predict the region’s climate will begin to match that of Virginia or South Carolina in the coming decades. “Climate change is here . . . and there are a lot of things we have to be thinking about to take that into account,” Sandeen told his audience. That advice contrasts with the stance taken by President Trump, who famously tweeted that he believes the concept of global warming was “created by and for the Chinese” in order to harm the manufacturing sector in the United States. While many environmental concerns go far beyond a town’s borders, working on local initiatives to promote green energy can be empowering, said Marcia Gens, a member of the Sustainable Lexington Committee and the Lexington Global Warming Action Coalition. Gens said she has seen an uptick in interest in local environmental issues since Trump took office. “You want to think about the national scope, but this is where we can really make a difference,” Gens said. Bedford residents Carol Reynolds and Janet Powers attended the Lexington session, and they hope to create similar environmental programs in their town. “Trump’s initiatives, they are not going to make progress on the national level, so we’re going to do all we can on the state level,” Reynolds said. They’re part of a citizens group in Bedford that has grown from a handful of members to 16 people since the election. “We’re getting more and more people working on it, and we think it’s more likely that things will happen locally,” Powers said.